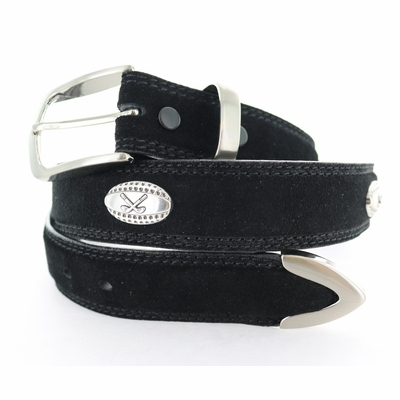 1-3/8"(35mm) wide Genuine Full Grain Suede Leather Belt with a Nickel Brushed finish 3 piece buckle set adorned with 5 golf theme conchos. Belt Features snaps for interchangeable buckles: Just snap off and snap on. Belt Size measured from where the leather ends at the buckle end to the middle hole at the tip end.